Megaman creator Keiji Inafune's Soul Sacrifice is hardly a cheerful game, but it is certainly a joy to look at, if what these people are saying is anything to go by. The story, the world, the choices—all interesting setpieces of a grotesque, tragic world, held together by combat that, at times, can get repetitive, but fundamentally works well. Here's what six critics have thought. Comcept has constructed a game that revolves entirely around slaying monsters. 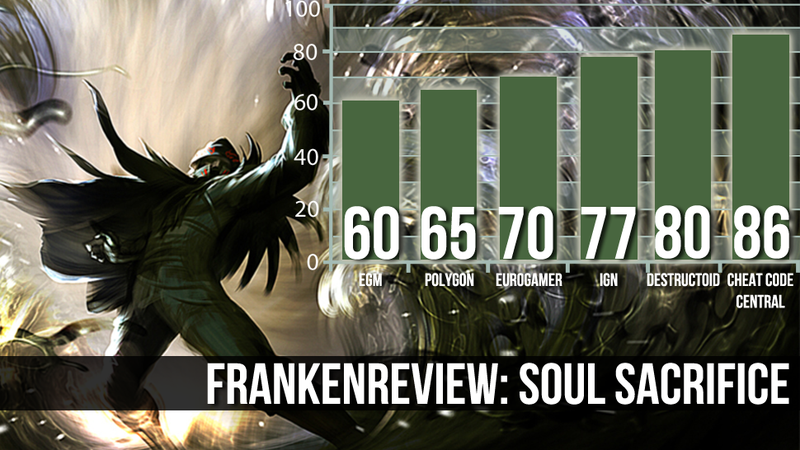 Big, small—Soul Sacrifice has got ’em all. Players assume control of a personality-deprived customizable character that interacts, primarily, with a sentient tome named Librom. Through this book (who functions as a talkative menu), the player magically relives the past life of a powerful sorcerer—one who spent a great deal of time with the game’s main antagonist, Magusar. It’s through these retellings that the player gains and masters more and more magical powers—and learns just what happened to bring the world to its knees under Magusar’s cruel rule. The concept at the heart of Soul Sacrifice is the player's option to save or sacrifice fallen enemies, from lowly goblins and orcs—twisted mutations of rats and cats, it turns out—to the archfiends, humans who have transformed into grotesque boss monsters. Choosing to save a fallen foe grants the player energy toward their life and defense, while sacrifices devote that energy to magic and attacks. The system doesn't challenge players to make moral choices, but rather has broad-reaching implications on a player's individual strengths and weaknesses, frequently resulting in difficult decisions with equally compelling outcomes. Weighing the risks and spoils of each sacrifice is rewarding. But your choices can also be easily undone and overwritten, so there's not as much weight to them as there could be. The enemy designs lie somewhere between Japanese folklore and Greek mythology, and while the cannon fodder is limited to demonic cats, rats, crows and spiders, the Archfiends get pride of place with around 20 nightmarish designs. There's the Hydra that chases you down with its multiple snake heads, the Cyclops that burrows underground before impaling you with its trident and the glutinous Slime that spews an endless torrent of grizzly confetti. Each one has been animated to a pleasingly high standard and they can absorb a considerable amount of punishment before returning to their human forms. Once I got used to the way Soul Sacrifice feels, however, it was easy to get pulled into its satisfying scoring and loot systems as I delved deeper and deeper into Librom’s story. Players can fight with Offerings they earn after each battle, rummaging through and organizing them to create various permutations that will best fit the desired play-style. For instance, in your six available Offering slots, you’ll likely want to have some curative moves, perhaps a missile-based attack, and some melee strikes that take advantage of different enemies’ weaknesses. There’s considerable depth here, whether you’re looking to get up close and personal with the monsters you fight, keep a safe distance and launch spells from afar, or just about anything in between. Offerings can be upgraded and combined, too, opening up yet another door through which you can easily get lost in customizing bliss. The game can be taken online or played locally in a team of four, allowing for some jolly cooperation. Multiplayer fights play out exactly like a solo fight, with the addition of some fun little chat commands that can be brought up with a pleasantly convenient flick of a touch-screen pop-up. Going online to show off one's acquired moves and costumes is a good laugh in and of itself, and the potential to sacrifice your own friends for personal power is likely to prove a most engrossing aspect of the co-op experience. Unlike similar games, Soul Sacrifice's multiplayer doesn't feel like the main focus, with solo play proving the robust draw, but its inclusion only helps round out the package. Soul Sacrifice is a tense game. With so much choice thrown at the player so consistently, it becomes easier and easier to make these choices, but the constant doubt of choosing correctly never really fades. There’s an intricacy to the world building here that is truly exceptional. The game would be better served, though, if that intricacy extended to the combat.